The SSC conducts CGL examination every year to recruit manpower for various posts in different government departments and ministries. Lakhs of candidates applying for the very few positions offered every year through this examination and thus the competition remains fierce. Good preparation, hard work and retaining confidence are some elements that can make the candidates successful in cracking the examination. Staff Selection Commission (SSC) conducts Combined Graduate Level (CGL) examination for various posts in different government departments and ministries in the country. Lakhs of aspiring candidates who want to join government jobs apply for these examinations to get placed in a reputed government job. The competition of SSC CGL posts is getting severe every year with more and more candidates, giving the written examination, which is the first of the Four tiers of selection. The candidates need to go under prelims and mains written examination followed by Descriptive Paper & computer proficiency Test from the commission to finally get selected for the posts. Hence, the candidates need to cross each of the hurdles with utmost care and preparation to ultimately make it to the list of successful candidates, issued by the commission at the end of the recruitment process for a particular year. Are there any short cuts to crack SSC Exams? The candidates, after filling the form for the SSC CGL examination, should start preparing for the written tests to score well. The prelims examination level is lower than that off the mains and thus many take it casually. But it could turn out to be the most vital mistake from the candidates, as this is the gateway to get successful in this recruitment. 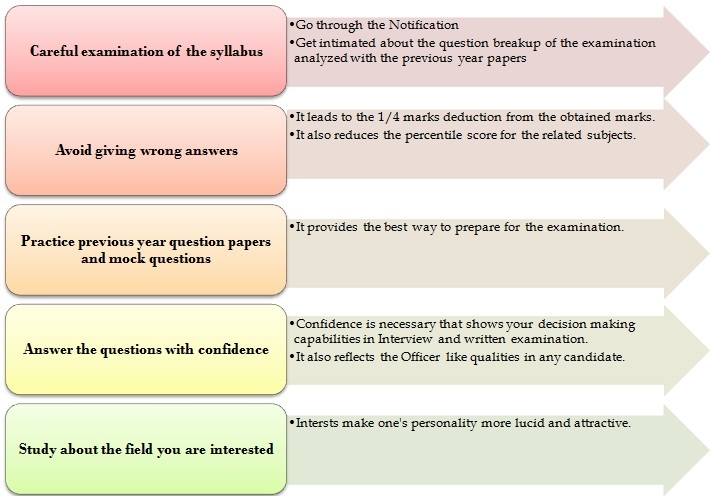 Though the marks of the prelims examination doesn’t get counted in the final selection, the candidates must score the cut off marks to move forward to the next round, which is the mains written examination. Careful examination of the syllabus of written examination: The candidates must undergo the official notification available along with the application form to know more about the syllabus and examination pattern. They should look for both the prelims and mains written test syllabus in detail to start preparation accordingly. There are specific questions and patterns of questions that the candidates must follow to crack the examination with good marks. Avoid giving wrong answers: The first and foremost rule, while giving the written examination, is to avoid mark wrong answers or answers with which you are not sure about. Giving wrong answers means deduction of one-fourth marks of the actual marks in the question. This could lower your chances to get through the prelims round and move to the main round of written test. Can I apply for SSC exam after qualifying B.Tech in Computer Science and Engineering? Practice previous year question papers and mock questions: The best way to prepare for the examination is to create an environment of competition. The candidates must undergo group studies and practice previous year questions and mock papers. This gives perfect idea to the candidates about the time they are ticking to solve particular number of questions. They could better their score by taking this approach of solving questions, while preparing. Answer the questions with confidence: Confidence is the key to success for any particular competitive examination. It can make or break chances of candidates in any crucial stage. Not only in the written test, but it is important to get hold of yours nerves in the personal interview round and face the board with confidence. This helps scoring well in the recruitment rounds and increases your chance to get selected finally for the post. Study about the field you are interested: After clearing the mains written test the candidates would be posted to the various posts which are available in different departments and ministries. The candidates must have a clear idea about the particular post or department they have applied for. This could help them answering the questions asked in the interview round by the board. This gives the additional edge from the other contemporary candidates who are racing along with you to bag the post.